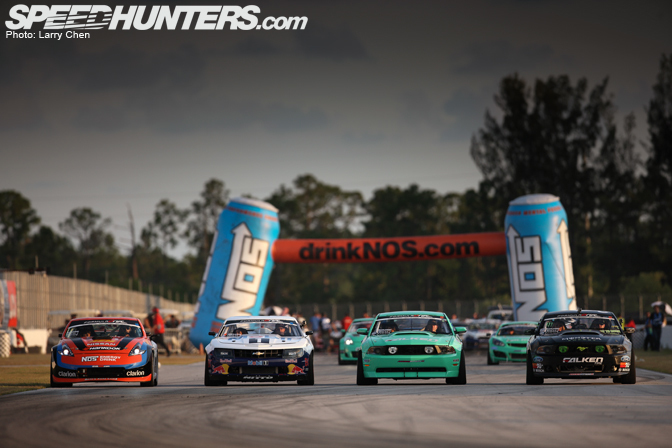 I was looking forward to Round 3 of the Formula Drift Championship series as soon as I heard it was going to be held in Florida. 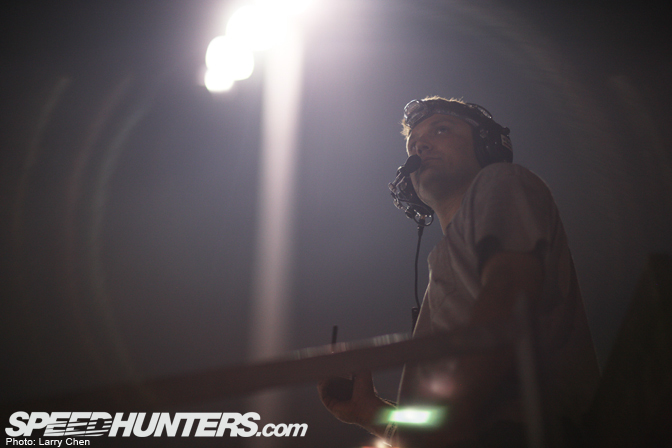 It is refreshing to be able to shoot at a new track with new surroundings. The City of Palm beach is beautiful and the people were very nice to our little traveling circus. It really was the perfect host city. 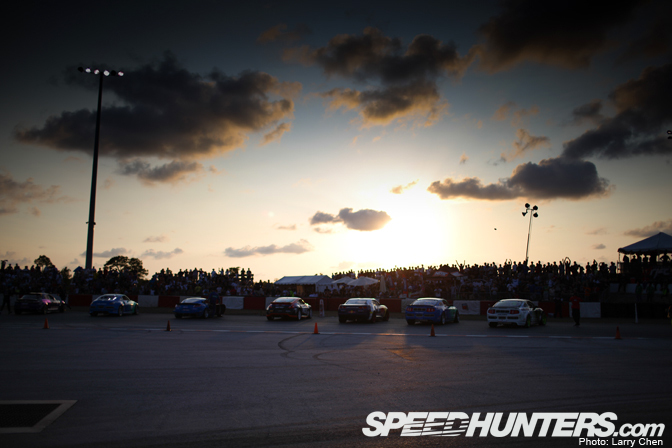 To top it off, most of the main competition was during sunset, which made for killer photos. 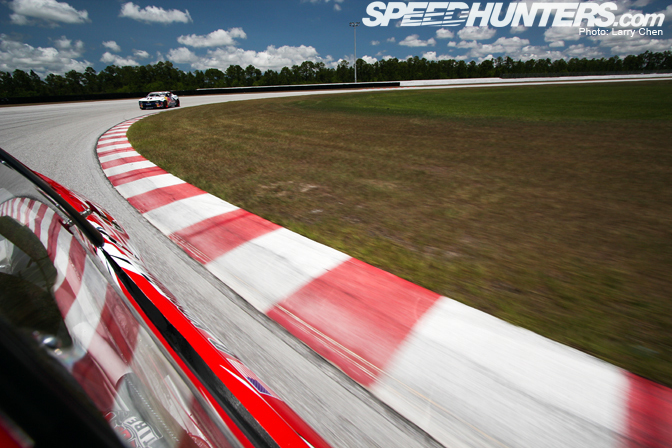 This is a view from Jeff Jones’ driver side mirror, going into turn one. I would probably just drive off the road if I saw Ken’s devilish looking car in my rear view. 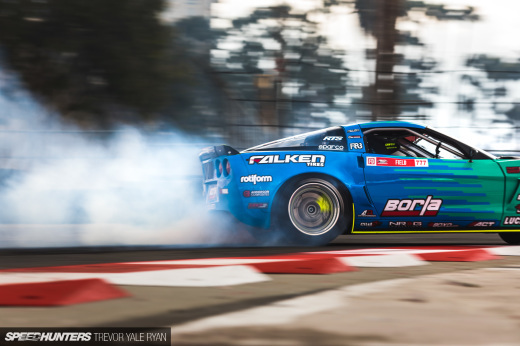 Tyler McQuarrie did his best Mighty Mouse impression for all the Falken drivers. The Monster is back. 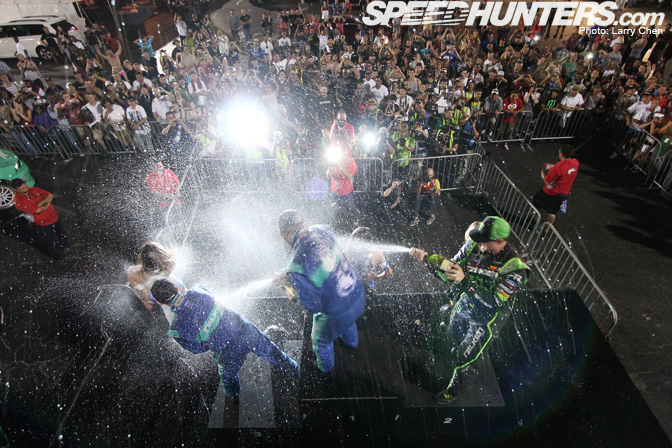 Vaughn Gittin Jr. piloted his Mustang with pure skill all the way to the podium. 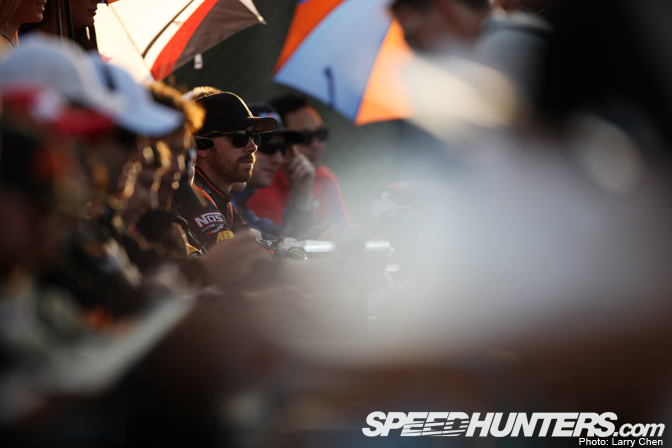 Make sure you check back for a very extensive driver blog from “Mr. 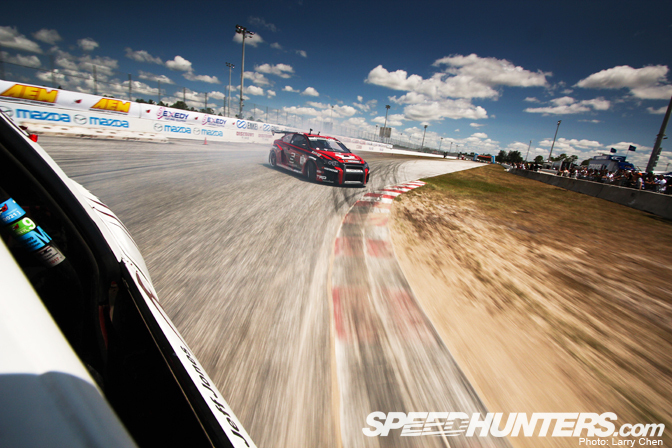 drift with one hand on the wheel”. Luke Lonberger lays down a smokescreen for Daijiro Yoshihara on the last corner. Luke made top 32 for the first time in his Corvette. Since this is a new track, we explored as much as we could, to find the best spots to shoot photos. We didn’t have a ladder with us, so we just improvised to get a higher vantage point. Luckily, I stumbled upon this scissor lift. 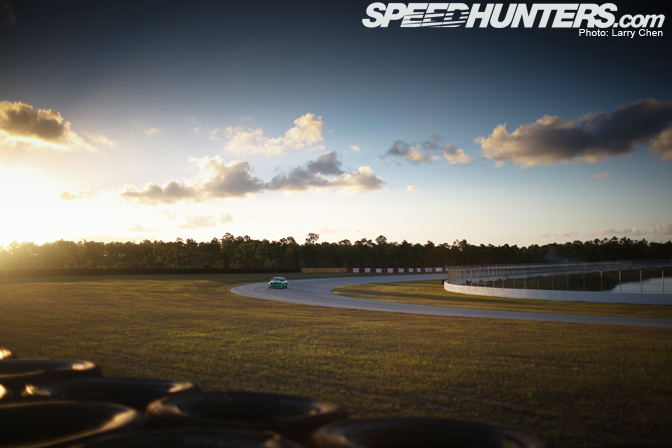 This track has the second fastest entry speed out of all the stops in the series. I had no idea Tusken Raiders wore fanny packs. I was almost certain Conrad Grunewald would qualify 1st three rounds in a row after seeing how backwards his entries were during practice. 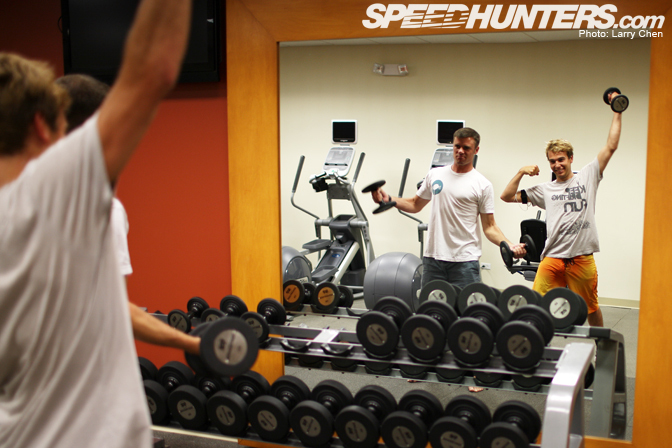 It seems like everyone has some sort of routine when it comes to pre-race activities. 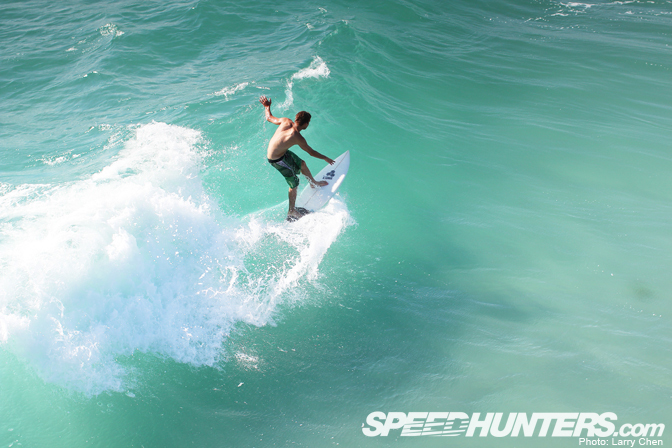 Matt Powers, Team Need for Speed driver, decided to hit the beach. I hear about his surf trips all the time and I get really jealous but mostly mad. I guess he needed to clear his mind and enjoy the day a bit, before the stress hits him in the face. It looked like fun and I would have joined him, but I am a terrible swimmer. 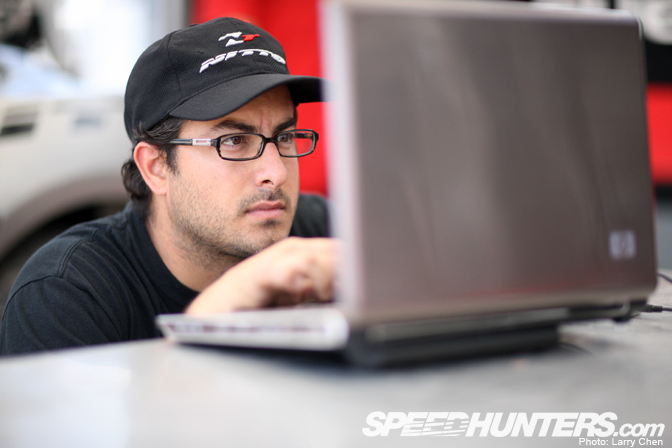 Mike Essa’s pre race activities include catching up on the latest episodes of Glee. Everyone dealt with the sweltering heat differently. Justin Shreeve used gravity to take care of the sweat on his forehead. DJ Miki Taka had to re-apply her lip gloss every few minutes, from all the babies foreheads she kissed. Team Need for Speed’s Victoria Mai, turned into a Zombie after standing out in the sun too long. 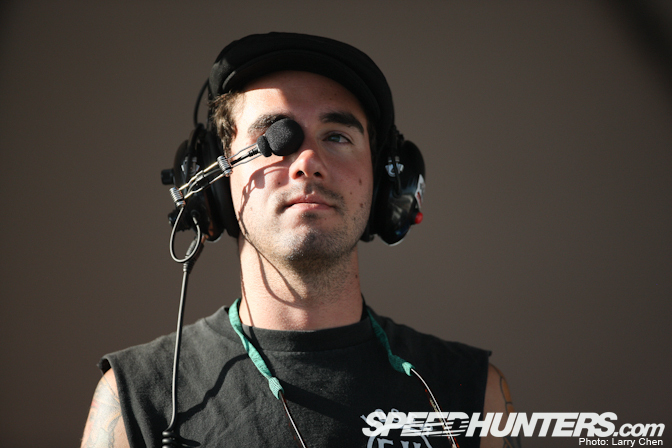 Matt’s spotter, Tommy Roberts, got assimilated by the borg. At least he didn’t turn into a zombie. According to John Russakoff, the secret to a great qualifying run is taking a quick nap on the starting grid right before you are about to run. 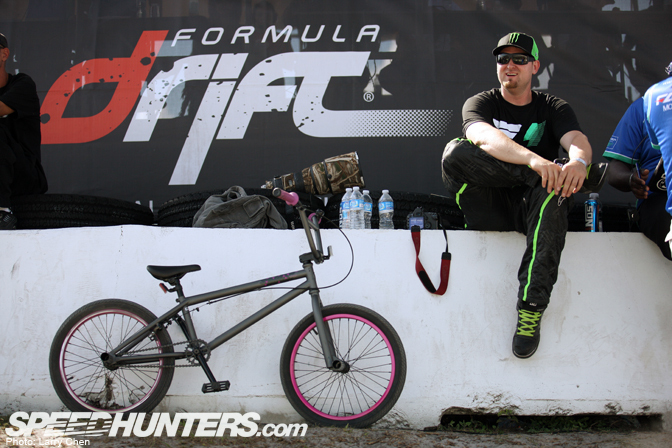 The newest Formula Drift judge, Ryan Lanteigne, gets his shopping list in order. Linhbergh forgot he was in Florida and started doing some Jersey fist pumps with the Need for Speed girls. I worry about Ron Bergenholtz sometimes. It looks like he is going to shoot fire out of his ears from being stressed out all the time. 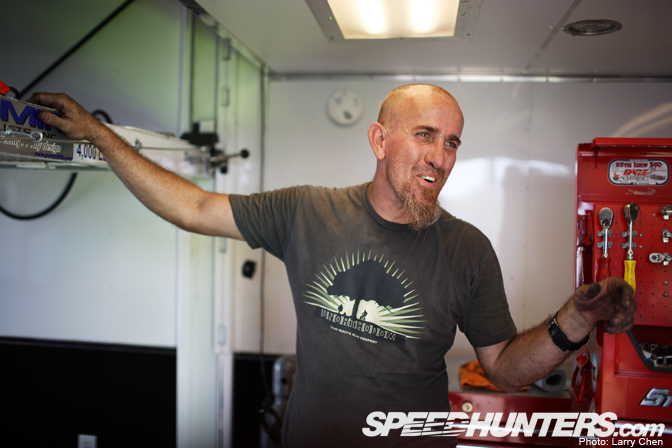 Fredric Aasbo has the longest fingers ever. I feel like they can wrap around the steering wheel twice! 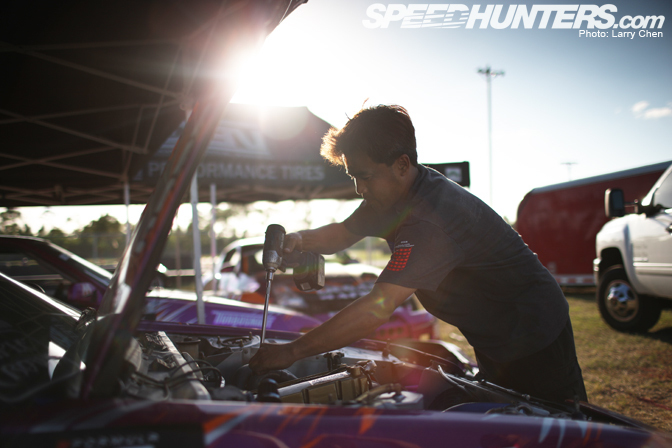 Stephan Papadakis worked hard on the Need for Speed Scion tC all weekend. 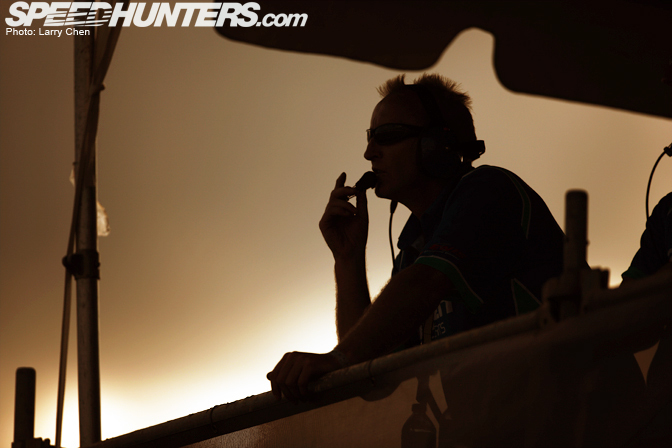 Fredric had some amazing angle during his qualifying runs. He ended up qualifying 6th, a personal best. Fredric took the loss to his teammate in stride. He was even nice enough to give Tommy his arm back after ripping it clean off. I waited for hours to get a photo of Vaughn riding a bike with pink accents, but he knew what I was up to. 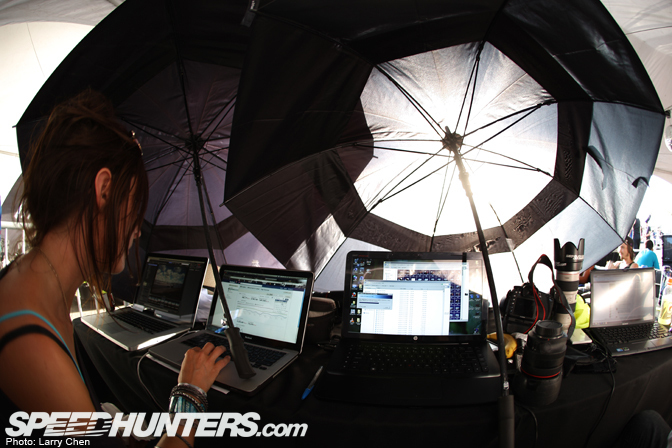 The nice thing about this track is you can watch all the action from almost anywhere. Of course, the best view of all was from the Judges’ tower. 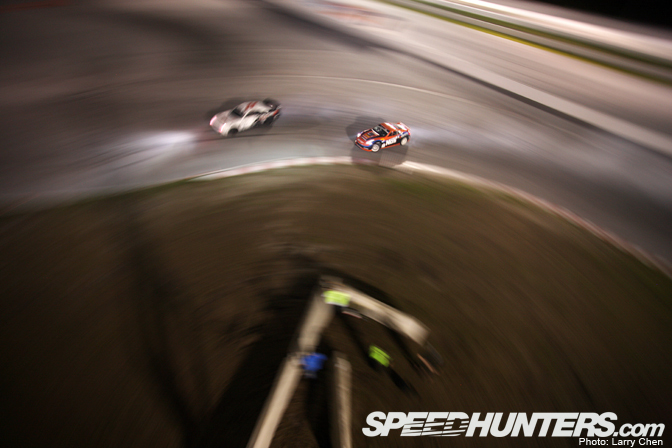 Rhys Millen went crazy from the Florida humidity. Samuel Hubinette decided to help out his friend by signing his posters for him. I can only imagine how hard it was for the drivers to not drift the cool down area. As always the crowd went nuts. Chris Forsberg qualified 1st and finished a very respectable 4th place. 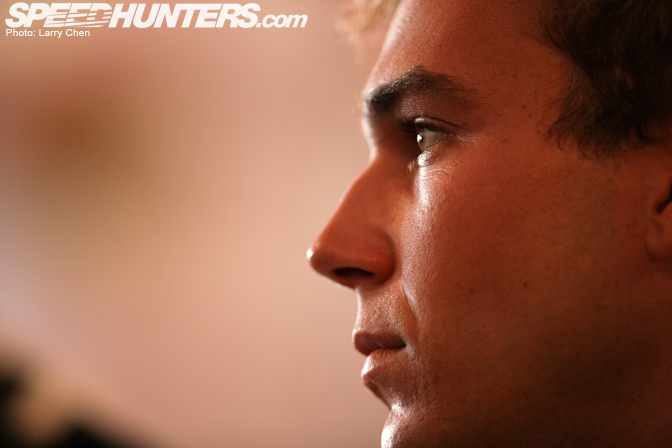 I am sure we will be seeing him on the podium this season. Jeff Jones is a one man show. 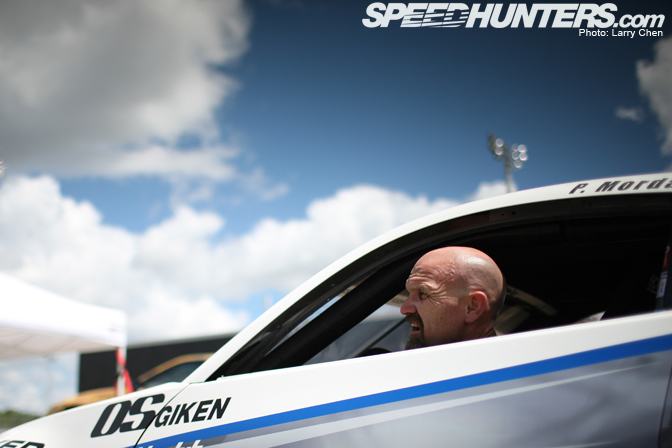 He tows, fixes and drifts his car from event to event. What dedication! 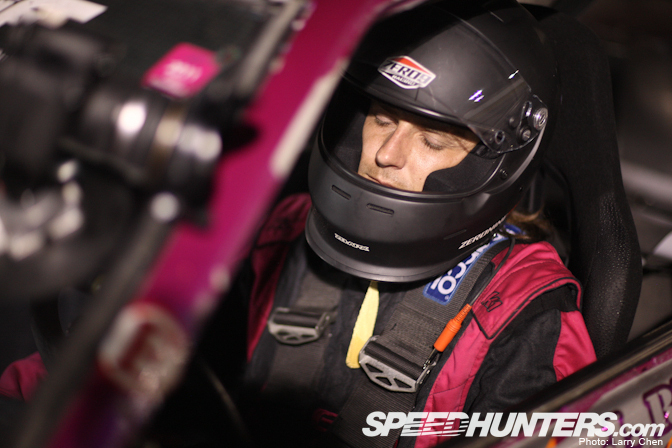 Matt Powers used to be a one man show, but now he is doing way better, since he is concentrating on his driving. The call between Fredric and Matt was very close. 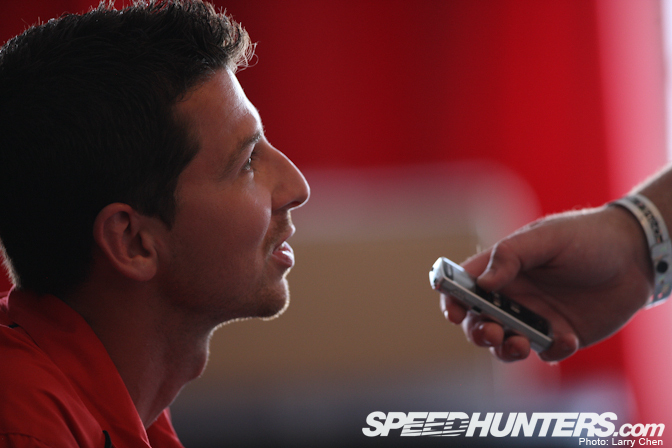 I hope there will not be any more cannibalism on Team Need for Speed for the rest of the season. I could not help myself from “cloud-hunting” from morning till night. 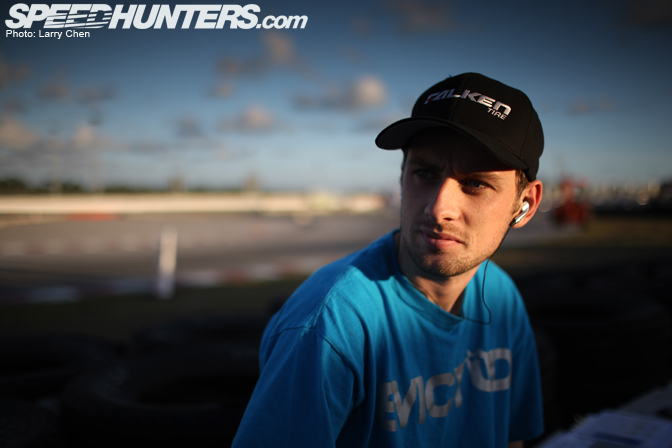 Gardella Racing driver, Ryan Tuerck, crows like a rooster before going into battle. 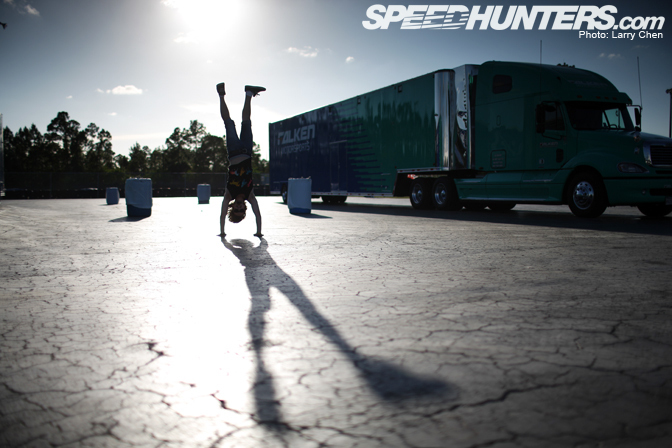 His ritual seemed to work since he knocked out Formula Drift rookie, Walker Wilkerson in the top 32 bracket. 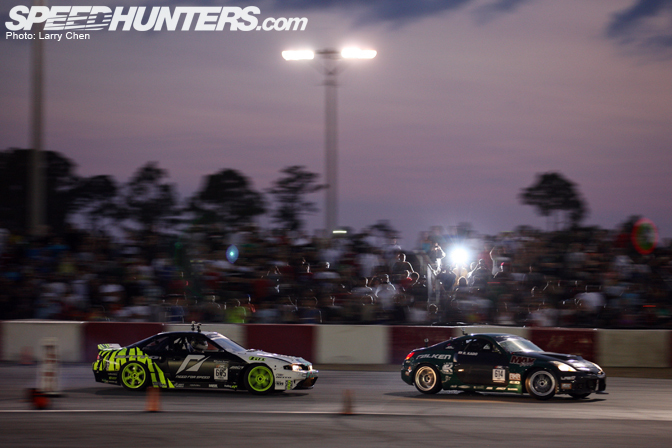 Justin Pawlak crowed way harder at the starting line. That helped him knock out Ryan in the top 16 bracket. Afro, from South Africa is seriously the most dedicated fan I have ever met. 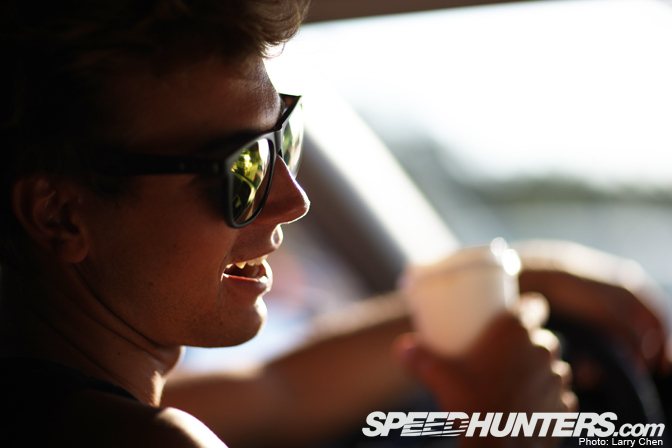 He used to fly from his home country to attend Formula Drift events as a spectator. 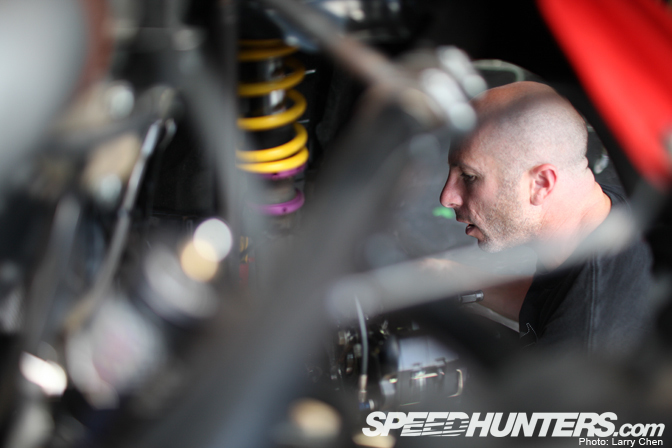 Now he helps out Otto Graven and his crazy looking 350z. I wonder what Otto thinks of the active aero that Afro installed. 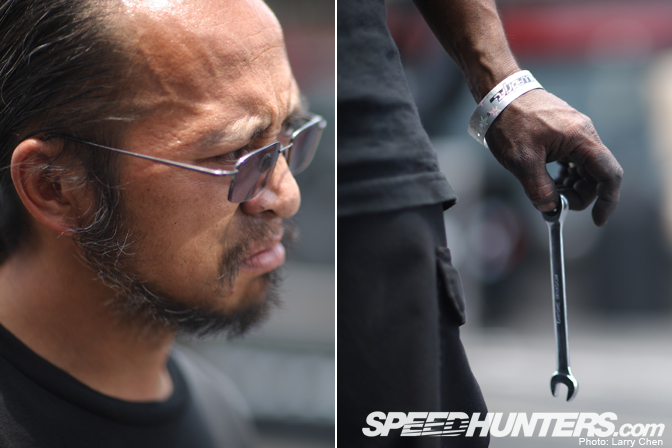 Taka knows his car like the back of his hand. 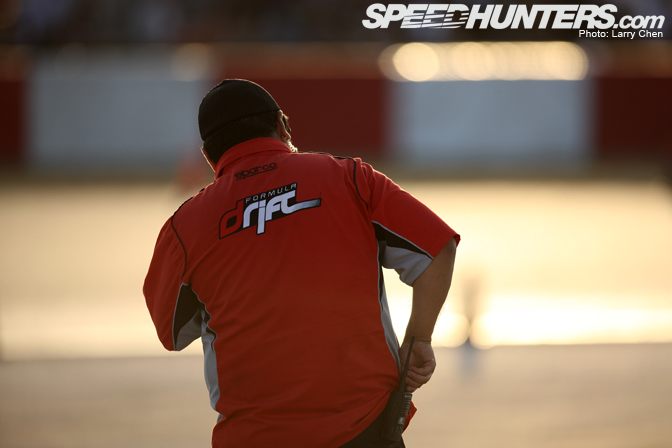 It is good to see him back on the top 16 after a string of bad luck last season. Charles Ng must have played with quite a few fire trucks when he was younger. 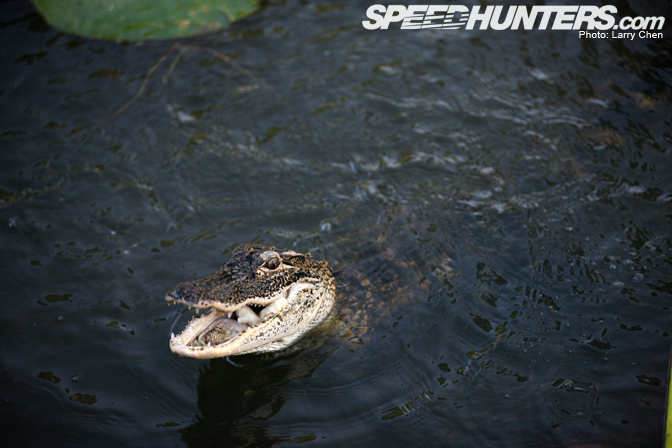 These friendly creatures were hanging out in the swamps that surrounded the track. They loved us so much they hissed at us. 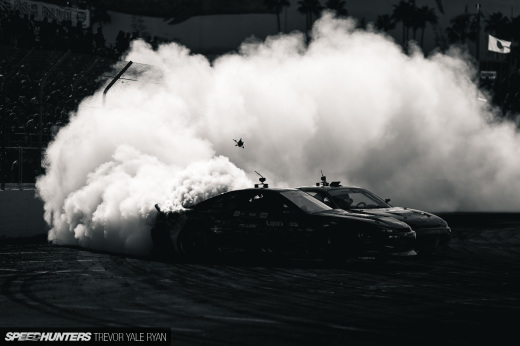 The ghosts of drift materialized all the way from Japan to watch Matt Powers do his thing. 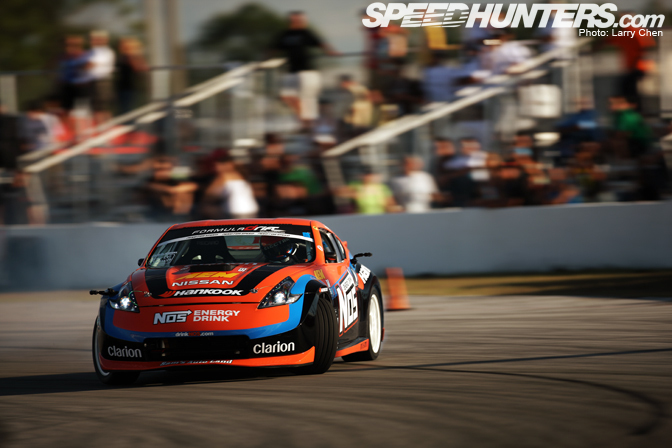 They are not pictured, but Scott decided to scope out the local scenery in Palm Beach with Pat Mordaunt’s 350z. Samuel locked up all fours trying not take Conrad’s door off. Darren was running consistent like always. I think he has one of the more photogenic cars on the FD grid. I must come from his competitive male modeling background. We made a mini “Fort Knox” in our work area. You wont be able to steal gold bars from these walls of water resistant fabric. 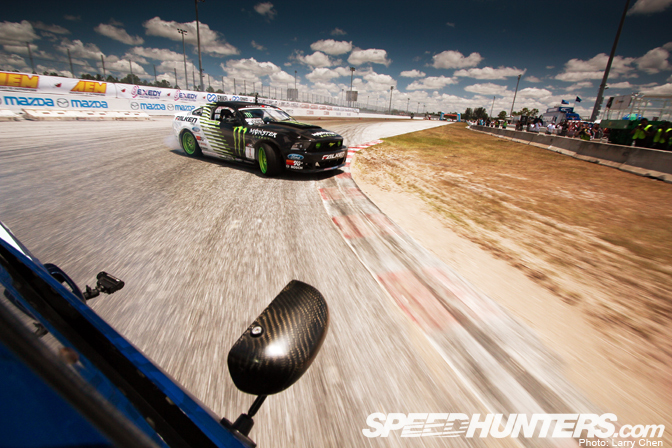 It is always a challenge to run an event on a new track, but the Formula Drift staff dealt with it. 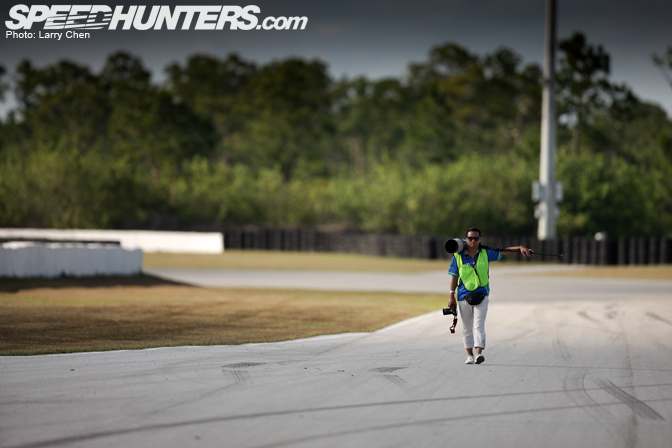 Palm Beach International raceway was one of the most beautiful tracks I’ve ever shot at. I can’t wait to go back next year. Maybe I will have the guts to join Matt on a surfboard. Epic post. Truly great coverage! Hey, his shopping list was long... and FRENCH! Lol! I think I'm the only guy at a FD event with a voice recorder. Astonishing pictures, as always!! Specially the last one!!! Amazing coverage. Stunning photography again, Larry! Great wrap up, great pictures and great read. Thanks! Awesome pictures!!!! Makes me wanna pick up my camera and go out there to shoot right now! Beautifull! Larry dude you did it again! Excellent coverage! Great photos and always enjoy your hilarious comments man! See ya'll next year!! Love the pics and write-up as always, Larry!